Well so much has happened since our last E-mail. In Chapman's Peak we met Des and Charlotte who have travelled extensively through East Africa and were able to give us lots of good advice on things to see and do. From Hout Bay we travelled to Cederberg NP. This NP has some superb mountain scenery. We stayed at Krom River and saw some impressive Bushman Paintings and then travelled through to Wupperthal along a mountainous 'jeep' track, which criss-crossed a huge deep valley. I have to agree with Sheila Newman that Wupperthal looks like the Hermansberg Aboriginal community (Thanks DES - this was a great place). We arrived in Calvinia and stayed the night at the municipal caravan park. From there we travelled to the Augrabies NP which features a waterfall on the Orange River. We crossed the Orange River previously in Lesotho. This is a very large river and travels through semi-desert country. The water is used extensively for irrigation. 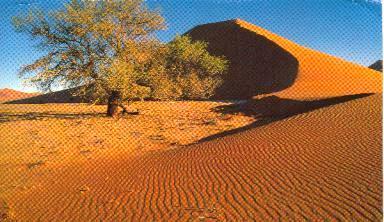 Next we visited the Gemsbok NP in the Kalahari Desert bordering Namibia, South Africa and Botswana. The desert is very similar to our deserts however the sand dunes here are covered in Bushman's Grass rather than spinifex. This NP is centred around two dry riverbeds. To attract wildlife windmills are used to provide watering points at regular intervals. We saw Gemsbok, Wildebeest, Hartebeest, and Springboks but only heard lions at night. We enjoyed our time in South Africa. We had heard a lot of negative things about SA but we did not encounter any problems. SA has excellent camping grounds and very good roads. Price-wise things are very similar to Australia. There are gum trees everywhere to remind us of Australia. We also saw the disparity between the large population of very poor people and the very rich. There are Mercedes Benz and BMW cars everywhere. We saw some very fancy and posh looking homes and lots of black shantytowns. From Uppington, we left South Africa and travelled into Namibia. 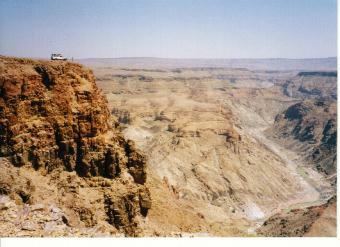 First stop was Fish River Canyon, which is similar in size to the Grand Canyon in the US. We stayed at Ai-Ais, which was at the base of the canyon, and it was very hot. We tried to cool off in the swimming pool however the water was like having a warm bath. 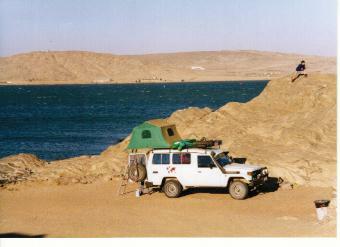 Next we continued onto Luderitz through some amazing desert country. There was absolutely no vegetation: just sand and rocky mountains. The dunes continued right up to the ocean. We drove against strong head winds and sand blowing across the road. Whilst Luderitz is on the ocean it basically never rains, just fog and light mist. We stayed on the very windy and exposed Shark Island campground. This is a very typical German town and has a large fishing fleet and Diamond mine. We took a drive to Diaz Point to see the Fur Seals and Flamingo's through the typical moonscape landscape. We next visited Sossusvlei NP. This is reputed to contain some of the world's tallest sand dune. These sand dunes cover an area of around 150km by 150km and it is said that they were formed from the sand washed into the ocean by the Orange River. We arrived at the clay pan at sunrise and climbed to the top of the largest sand dune. It was very spectacular. Last night we stayed in the Namib Desert with a Kenyan couple who have just driven overland from the UK through West Africa. Due to the problems in Zaire they shipped their car from Ghana to Cape Town. They are travelling in the same direction as us so we may travel together for a while. We are keeping well and having a great time. Shall send you another update when we get to Botswana in a few weeks time.